This gluten-free recipe is one of our top recipes for gluten-free and gluten-full snacker’s alike! Dietary Specialty: Gluten Free, Grain Free, Low Carb, Low Sodium, Soy Free, Vegetarian. Preheat oven to 350°F. Line two 8-inch round cake pan with parchment paper or oil and flour pan well; set aside. Cream butter and sugar until light and fluffy, 7 – 10 minutes. 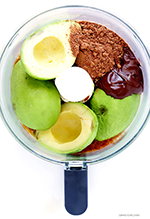 Add in eggs, one at a time, and beat until fully blended. Add milk and extracts and mix until combined. In a separate bowl, combine Bob’s Red Mill Almond Meal/Flour, Organic Coconut Flour, baking powder and salt. Add the flour mixture to the butter mixture and beat until creamy. Divide batter evenly between the prepared cake pans and smooth tops. Bake until set and a tester inserted in the center comes out clean, about 25 minutes. Let cool completely. 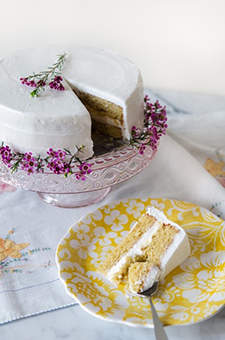 Stack the cakes on top of each other with a generous layer of frosting between. Cover the top and edges with remaining frosting. 2. Cook grains according to package directions and set aside. 3. Place cut peppers, sweet potato, onions and corn on a foil lined sheet pan. Drizzle tablespoon olive oil and toss gently to coat. 4. Roast 15 to 20 minutes. 5. 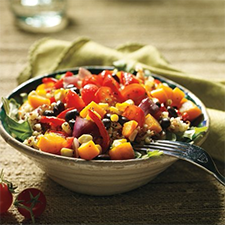 To build the bowls, evenly distribute the arugula into 2 large bowls. Next top with grains, bell pepper mixture, cherry tomatoes and beans. 6. Combine remaining olive oil, lime, maple syrup and cumin in a small bowl and stir. Drizzle over salad and serve. You can have your chocolate mousse and eat it too. A fantastic source of vitamin E and — thanks to the Neocell Collagen Powder — skin-boosting nutrients, this mousse is a perfectly healthy dessert. The healthy fats and magnesium make it a winner. Pit ripe avocados and scoop out of shell. Pit date, and put both in food processor or blender. 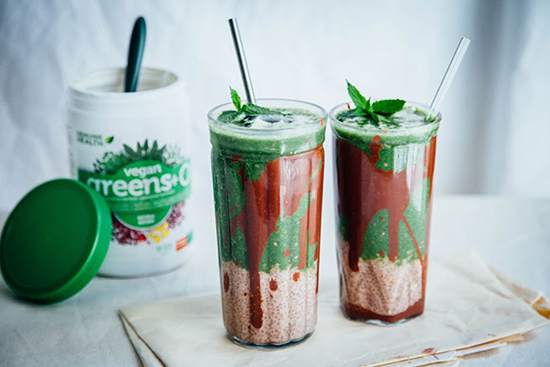 Add Amazing Grass Protein Super Food Chocolate Peanut Butter, Neocell Collagen Powder, vanilla extract, cinnamon and cacao powder. Blend until mixture reaches the desired consistency. If wanted, stir in stevia or honey. Pour mousse into plastic bag, seal bag and snip off corner to create a piping bag. Squeeze into dessert cups. Top with berries and cacao nibs, then serve. 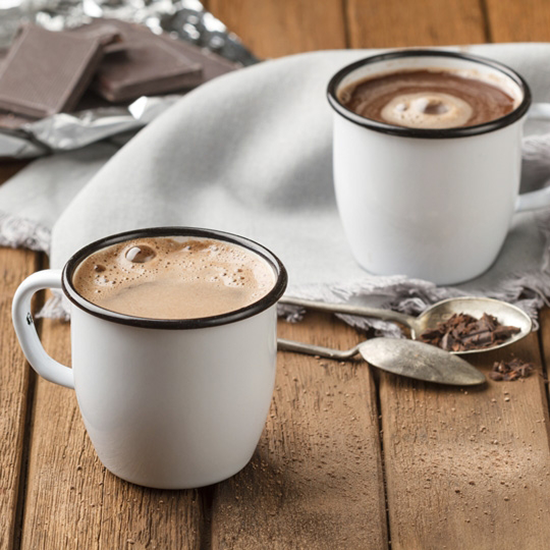 A mellow melange of exotic chai spices and black tea warms the body, mind and spirit with each sip of this sophisticated re-imagining of standard hot cocoa. 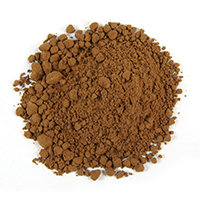 Frontier Organic Fair Trade Certified Cocoa Powder. 1 teaspoon Frontier Organic Fair Trade Certified Chai Tea. 1 heaping tablespoon Frontier Organic Fair Trade Certified Cocoa Powder (processed with alkali). 1 teaspoon Frontier Organic Fair Trade Certified Cane Sugar. 1. Bring almond milk and chai tea to a simmer, stirring frequently. 2. Add cocoa and sugar. Whisk vigorously until fully dissolved and frothy. 3. Strain through a tea strainer into a mug and serve. Top with a whipped cream and a dusting of ground spices such as cinnamon, allspice and nutmeg. Optional: Allow to cool and pour over vanilla ice cream. To make the chia pudding: stir all the ingredients together and let sit for 10-15 minutes; the chia seeds will gel up and make it into a rice pudding-like consistency. Adjust according to taste. If it’s too thin, add more chia or 1 tablespoon of ground flax seeds. If it’s too thick, add more almond milk. Scoop into the bottom of however many glasses you are using. 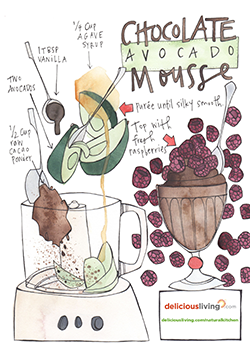 To make the smoothie: blend all ingredients together until smooth and the consistency you like. Add more almond milk or ice if it’s too thick. If you’d like it a bit sweeter, add 1-2 pitted dates. Pour over the chia pudding and enjoy with a spoon and/or straw! 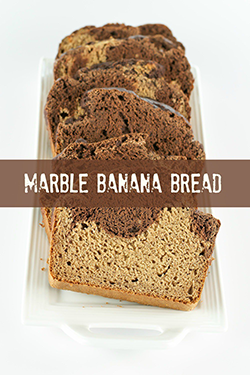 Sugar-free Vegan Marbled Banana Bread is a great treat for you and your family. 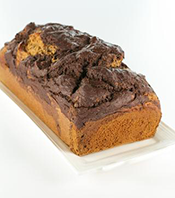 With only a touch of oil, this banana bread makes a great afternoon snack, or top it with a plant-based ice cream and fresh fruit for a delicious and easy dessert. Put the dates, bananas, coconut oil, applesauce, and NuNaturals Vanilla Stevia Drops in a high-speed or regular blender and process until very smooth and thick. In the bowl of a stand mixer (or in a big bowl if you're up to stirring it by hand), add flour, cinnamon, baking soda, powdered stevia and salt. Pulse at low speed a few times to combine. Scrape the banana mixture into the flour mixture and slowly start the stand mixer. Mix until a thick batter forms, then mix in the nuts, if using. Scoop out about 2/3 of the batter and set it aside. Add the cocoa powder to the NuNaturals Cocoa Syrup to the remaining batter in the mixer and process until completely combined. Now for the marble. You can either put all the vanilla batter into the pan and then add the chocolate batter - swirling deep with a knife or spoon - or you can alternate dollops of both batters and then swirl. Either way, swirl and then bake the cake for 55 to 60 minutes. Check if it’s done by sticking a toothpick into the center of the cake. If it comes out clean, it's done. Let the cake rest in the pan for about 10 minutes before removing it (and the parchment) from the pan and letting it cool completely on a wire rack, or eat it while it’s still warm. In recognition of National Popcorn Month we thought we would share a favorite popcorn snack recipe with our circle of friends. Enjoy! Holidays like Cinco de Mayo whet the appetite for flavors south of the border. Mexican and Tex-Mex cuisines are typically knows for bold and blood-pumping ingredients. And while other cultures may use rice, potatoes or pasta as the base for meal making, Mexican cuisine is based in corn, or maize, and features a wide range of corn products (tamales, tortillas, tacos). Maize is native to the Americas. It is a cereal grain that has been part of American culture for centuries. Maize varieties were grown throughout the pre-Columbian Americas, domesticated in Mesoamerica and eventually spread to the rest of the world after European contact with the Americas in the late 15th century and early 16th century. Some of the oldest examples of maize, including a primitive type of pod-popcorn, were found in the Bat Caves of west central New Mexico and in the Tehuacan Valley of central Mexico. Pods at various sites were found to be some 4,000 to 7,000 years old. In South America people valued their popcorn enough to be buried with it. Bowls or bags filled with popcorn were often found in burial grounds of ancient people of the coastal deserts of North Chile. The kernels were so well preserved they still popped even though they were 1,000 years old. Talk about shelf life! Apart from food, sixteenth century Aztec Indians used popcorn as decoration for ceremonial headdresses, necklaces and ornamentation. Young women danced a “popcorn dance” and wore garlands of popcorn in their hair. If you’re looking for an indigenous taste of the old, old “South” try this recipe for Chili Lime Popcorn. 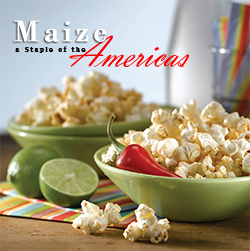 Popcorn pays homage to its birthplace with this simple recipe that combines a splash of lime juice with a dash of chili powder for a snack that shouts Viva Mexico! Preheat oven to 300° F. Spread popcorn on a baking sheet. Sprinkle yeast powder, lime juice, chili powder and salt over popcorn. Heat about 7 minutes and toss just before serving. Serve warm. Serve up healthy fats with this simple sheet-pan supper. It’s ready in about 20 minutes. Boost it: Stir 1 cup light coconut milk into the prepared rice for a creamier texture and refreshing flavor—and to help you stay full and energized a little longer. Cook rice according to package directions; set aside to cool. Preheat oven to 400°. Line a rimmed baking sheet with foil, and form a small ridge in the center of the foil to form two sides. Pat salmon dry, and place onto one side of the foil. In a small bowl, stir together honey, 2 tablespoons of the soy sauce, sesame oil, rice vinegar, garlic and ginger. Spoon sauce over salmon. Toss broccoli with remaining 1 tablespoon soy sauce and the vegetable oil, and spread on the other side of the baking sheet. Bake for 12–15 minutes, or until salmon is opaque and flakes easily with a fork. (If vegetables are not finished, remove salmon and continue to cook vegetables or vice versa.) 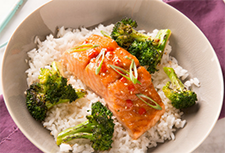 Serve salmon and broccoli over prepared rice. Spoon any remaining pan sauces over salmon and broccoli. Garnish with sesame seeds, Sriracha and/or green onions.